1939 is widely regarded as being Hollywood’s greatest year. It was the year that gave us Gone With the Wind and The Wizard of Oz and those two movies alone would have been enough for it to be remembered as being a good year for movies. But 1939 was the year other classics such as Stagecoach, Dark Victory, The Women, Ninotchka, and Mr. Smith Goes to Washington all hit the silver screen for the first time. However, it was no coincidence that all these amazing films just happened to be released in 1939. A number of economical, political, legal, and historical factors all came into play to help create that perfect storm of cinematic excellence. 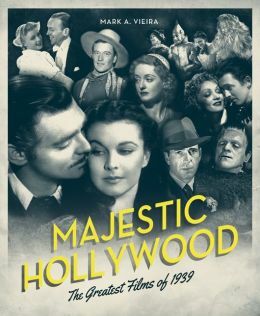 In Majestic Hollywood: The Greatest Films of 1939, the new book by Mark A. Viera, Viera explains the factors that helped make 1939 Hollywood’s finest year and highlights fifty of the year’s best films. Of course you can expect to find the really big hits like Gone With the Wind and The Wizard of Oz featured in this book, but there are also several films that are often overlooked when discussing the movies of 1939 such as Bachelor Mother, In Name Only, Five Came Back, and They Made Me a Criminal. Rather than approach each film with a critical perspective, Viera discusses the films in Majestic Hollywood very matter-of-factly with details about the production of each movie, quotes from people who worked on the movies, and comments from critics. In the introduction, Viera explains, “I did not see it as my job to critique them, deconstruct them, or warn you that they are ‘dated.’ My job is to transport you to a special time and place, where artists who were making big films for the end of a tumultuous decade ended with an array of cinematic art. Majestic Hollywood celebrates that art.” This is exactly what Viera accomplishes in this book. Majestic Hollywood is arranged chronologically and when you look at it that way, it reminds you of just how impressive that year really was. Not a month went by in 1939 without at least one indelible classic film being released. It’s easy to remember that Wuthering Heights, Dark Victory, and Love Affair all came out in the same year, but did you realize all three of those were released in the same month? If you’re looking for a gift for a classic movie fan, I highly recommend Majestic Hollywood. The combination of widely recognized titles with lesser known gems make it a great book for both long-time classic movie fans and people who are just starting to explore film history. Fans of pre-code cinema are no strangers to the name Ann Dvorak. Her electrifying performances in movies like Scarface and Three on a Match helped give those movies a quality that makes them enjoyable over eighty years later. But to other movie fans, her name probably doesn’t ring any bells. Ann Dvorak is a movie star who never really became a movie star. When she was moving up in the film industry, she came up alongside the likes of Bette Davis and James Cagney. Joan Crawford was a mentor to her. Her performance in Scarface had people calling her “Hollywood’s new Cinderella.” But like her contemporaries Davis and Cagney, Ann Dvorak wasn’t afraid to challenge her studio bosses when she wasn’t happy with the way she was being treated. However, Dvorak’s battles against the studio were poorly planned and as a result, her career never reached its full potential. Despite such a promising start, Dvorak was relegated to supporting roles and mediocre movies for the rest of her film career. similar reaction, but I never knew much information about her until now. In Hollywood’s Forgotten Rebel, Rice reveals a very intriguing woman. Actually, I found the parts covering Dvorak’s life when she wasn’t acting more fascinating than the parts about her film career. She was a woman with a wide range of interests outside of acting and she did her best to pursue them all. During World War II, she went to England with her first husband and spent time driving an ambulance, working on a farm, and writing newspaper articles. In her spare time, she enjoyed studying bacteriology. In her later years, she tried creating a program for teaching history in universities. Dvorak’s compelling story paired with Rice’s writing style make Hollywood’s Forgotten Rebel an absolute pleasure to read. I didn’t want to put it down. There were times when I’d sit down to read just a little bit and before I knew it, I’d be a good fifty pages further in it. 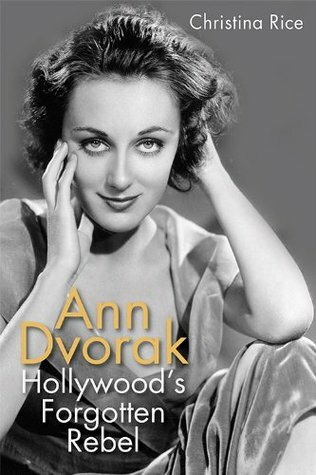 Whether you’re already a fan of Ann Dvorak or are just interested in hearing a largely forgotten Hollywood tale, Ann Dvorak: Hollywood’s Forgotten Rebel is well worth your time. 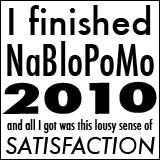 Posted in Books/Magazines, NaBloPoMo 2013 and tagged Ann Dvorak on November 19, 2013 by Angela. When Vivien Leigh portrayed Scarlett O’Hara in Gone With the Wind, she instantly earned a permanent place in the pop culture lexicon. Although the public will always best remember her as Scarlett, Vivien did not let Scarlett define her life. She had little interest in becoming a conventional Hollywood star and was selective about her subsequent films. After the success of Gone With the Wind, she returned to the stage in England, determined to prove that she had more to offer. She certainly succeeded at that and alongside husband Laurence Olivier, they became the king and queen of British theater. They were one of the ultimate celebrity couples and when they took their show on the road, audiences flocked to see them. But, like everybody else, Vivien’s life had its ups and downs. Her marriage to Olivier eventually came to an end and she struggled with bipolar disorder. But two things that could never be taken away from her were her drive and her talent. As far as classic film biographies go, the ones I always most enjoy reading are ones that are real labors of love. Vivien Leigh: An Intimate Portrait is most definitely a labor of love. Author Kendra Bean has spent the last five years in England researching this book and has been able to access sources that no other biographer has used before, most notably the archives of Laurence Olivier. Since Olivier did not speak with the authors of other Vivien Leigh biographies, having access to his personal documents and correspondence allowed Bean to offer a more personal look at their relationship and at Vivien’s struggle with bipolar disorder than past biographies were able to. Bean was also able to interview people who knew and worked with Vivien, including Claire Bloom (who also provides the book’s foreword) and Olivia de Havilland. I simply can’t fathom how any fan of Vivien Leigh wouldn’t enjoy Vivien Leigh: An Intimate Portrait. Although not a comprehensive biography, it has enough information that someone like myself, who has long appreciated Vivien as an actress but never knew much about her personal life, can learn quite a bit from it. After reading it, I had a newfound admiration for Vivien’s drive and professionalism. Any Vivien fan is sure to love the hundreds of magnificent photographs featured in the book, including many rare and previously unpublished photos. It is a true feast for the eyes. 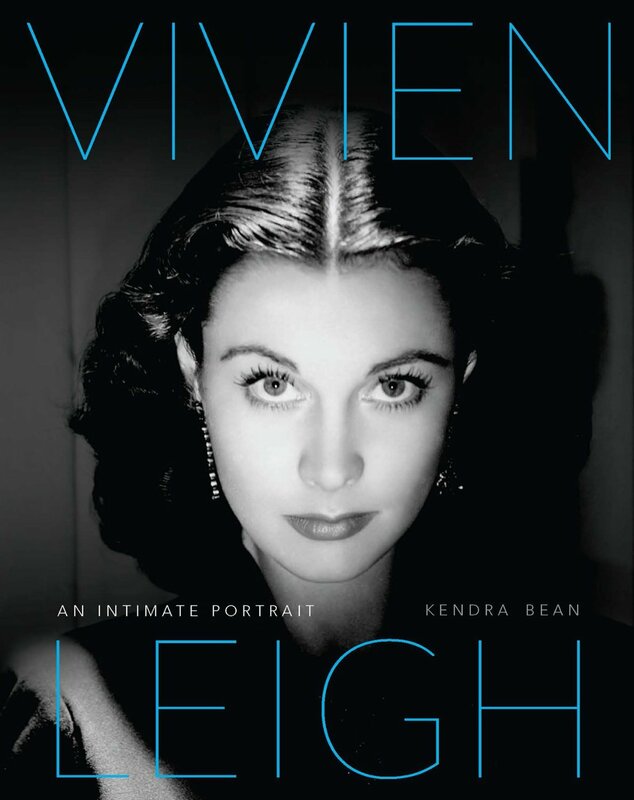 Vivien Leigh: An Intimate Portrait was published just in time for the hundredth anniversary of Vivien’s birth and is a wonderful, very fitting tribute to such a fine actress. Disclosure: I received a complimentary review copy from the publisher. John Gilbert was undoubtedly one of the greatest stars of the silent film era. He worked his way up from bit player to being one of Hollywood’s most popular leading men. At the height of his career, he starred in classic films such as The Big Parade, The Merry Widow, and Flesh and the Devil. Some of his co-stars included Greta Garbo, Lillian Gish, Norma Shearer, and Lon Chaney. But John Gilbert found out all too well that what goes up must come down. With the advent of talkies, his once flourishing career came to a screeching halt. With his career in decline, John Gilbert was driven into a spiral of self-destructive behavior that led to his death at the age of 38. 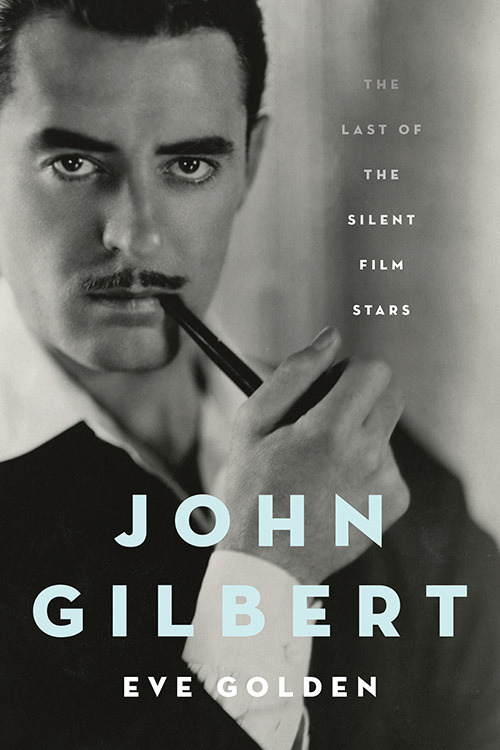 In “John Gilbert: The Last of the Silent Film Stars,” Eve Golden offers a clear, concise look at an often misunderstood star. It has a lot of good information without being overwhelming. If you’re just getting acquainted with John Gilbert’s films, this book is an excellent way to get to know more about him as a person. Golden also does a nice job of examining the myths surrounding Gilbert’s life and career. However, there are some aspects of his life that aren’t given the amount of attention they deserve. Most notably, surprisingly little attention is given to one of the most legendary parts of his life — his relationship with Greta Garbo. After having read biographies on Garbo that discuss her relationship with Gilbert quite extensively, I was disappointed by how little Golden discusses the same subject. Admittedly, Gilbert and Garbo’s relationship is surrounded by enough mystery and rumor that it could easily serve as the basis of a book by itself. But it would have been nice to see something between an in-depth analysis and a brief overview included in this book. Unfortunately, “What Would Grace Do?” can’t tell you how to become royalty or a movie star. What it focuses on are life lessons that can be gleaned from Grace Kelly’s life and the way she handled various situations. 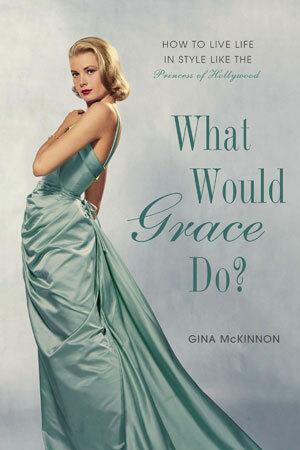 Whether you want advice on flirting, throwing parties, planning a wedding, or parenting, “What Would Grace Do?” has tips taken straight from Grace Kelly’s playbook. And, of course, it has advice for how you can channel Grace’s eternally chic style into your own wardrobe. “What Would Grace Do?” is a fun, lighthearted read. If you’re looking for a thorough biography on Grace Kelly, look elsewhere. It does have information about Grace Kelly’s life, but if you’re a longtime fan of hers, you’re probably already familiar with the details found in this book. But if you’re looking for a gift for a big Grace Kelly fan, it’s a book they might get a kick out of. Disclosure: I received a review copy by the publisher, Penguin Group. While many movie fans may admire the costumes they see characters wearing in their favorite films, not as many of them may know much about the costume design process. Renowned costume designer Deborah Nadoolman Landis seeks to remedy that with her new book Hollywood Sketchbook: A Century of Costume Illustration. Nadoolman Landis does a wonderful job outlining the vital, yet under-appreciated, role costume sketches play in the process of producing a film. Most importantly, she gives credit to some truly unsung people in the costume design process, the costume illustrators. While some costume designers do their own sketches, not all of them do and that’s where the illustrator comes in. The costume illustrator takes the designer’s vision and interprets it as a drawing that is shown to producers, directors, actors, and is given to the cutter-fitters, who turn it into a real garment. Not only does she offer a lot of insight to the importance of costume design, she’s found some incredible anecdotes from designers. My personal favorite story was about a time when Adrian was showing a sketch to Garbo, going into great detail about his reasoning for each of his design choices, while Garbo listened in absolute silence. Her silence was making him very nervous and when he was finished, she simply said, “Yes.” A moment later, she smiled, said, “Garbo talks!” and broke into a fit of laughter. Hollywood Sketchbook isn’t merely eye candy, it’s a decadent feast for the eyes. Lavishly illustrated with several hundred pages of costume sketches by sixty-one designers and illustrators, anyone with an interest in movie costumes could easily spend hours marveling at all the spectacular sketches. 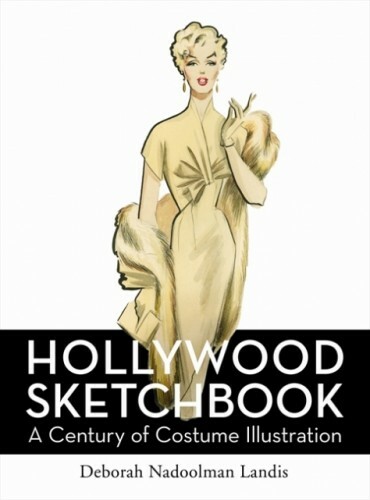 Although it features sketches of very famous costumes from movies such as Gone With the Wind, My Fair Lady, and Gentlemen Prefer Blondes, Hollywood Sketchbook is far from being a compilation of Hollywood’s greatest fashion hits. No film was deemed too unimportant to be represented in this book. In the section on Theadora Van Runkle, you can see sketches from The Godfather: Part 2 on one page and sketches from Myra Breckinridge on the next. I loved that Hollywood Sketchbook also avoids focusing only on glamorous gowns. There is no shortage of glamorous gowns to be seen here, but you also get a look at sketches for things such as togas from Animal House, hippie costumes from Hair, a suit of armor from Camelot, and a trooper costume from Spaceballs. While the sketches of recognizable costumes are fascinating to see, the most intriguing part of Hollywood Sketchbook is the unidentified sketches. Many times, costume sketches are created for designs that, for various reasons, never make it to the screen and several of those sketches are included in this book. Looking at those unknown sketches, it’s fun to imagine which movie they might have been created for or who they could have been designed for. Disclosure: I was given a complimentary review copy by Harper Design. Posted in Books/Magazines, Fashion in Film on February 20, 2013 by Angela. 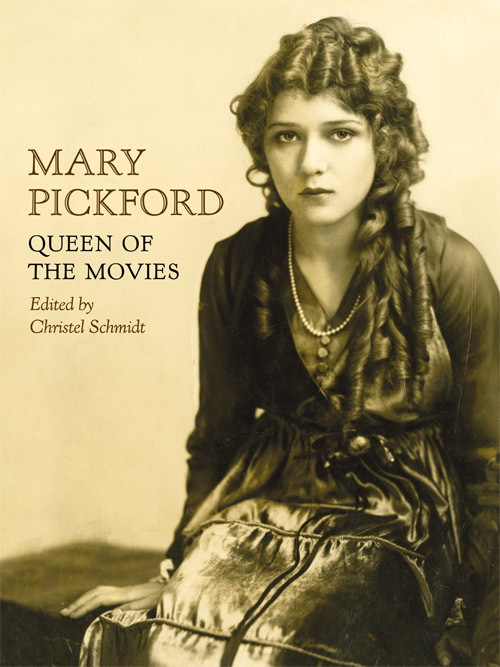 If you’ve ever wondered what Mary Pickford did to deserve the title of “Queen of the Movies,” the book Mary Pickford: Queen of the Movies (edited by Mary Pickford expert Christel Schmidt) will tell you everything you need to know and then some. Rather than being a traditional biography that traces Mary Pickford’s life from birth to death, Queen of the Movies is a series of essays by noted film historians highlighting various aspects of Pickford’s life. Not only does it examine her work in films, both in front of and behind the camera, it also looks at her “America’s Sweetheart” image, her philanthropy, her childhood, her impact as a style icon, her marriage to Douglas Fairbanks, and her efforts to help preserve America’s film legacy. Queen of the Movies is beautifully illustrated with over two hundred movie stills, posters, and other photographs of Pickford. For me, the biggest treat was getting to see color photographs of some of Pickford’s costumes from movies such as Coquette, Tess of the Storm Country, Little Annie Rooney, and Dorothy Vernon of Haddon Hall. I’m always very curious to see what the costumes I’ve only seen in black and white really look like. But Queen of the Movies is much more than just a picture book. It has a good balance of real insight and eye candy. Whether you’re a longtime Pickford fan or just getting acquainted with her work, you’re bound to enjoy Mary Pickford: Queen of the Movies. It is a true celebration of the achievements of a remarkable woman. Disclosure: I received a complimentary review copy from University Press of Kentucky.